Ever had one of those weeks that tests your sanity to the core? One thing after another, chipping away, provoking you to question whether or not you've actually lost it. You can feel your brain squeezing inside your skull, it hurts to think. But wait...reprieve from inevitable chaos! That brief moment when you take a breath, collect yourself and grab the coffee you left on the counter! "Okay - it's okay, let's try this again!" Sigh. Wham-oh! 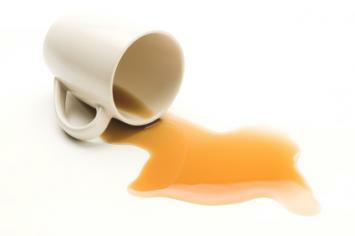 You smack your hip into the countertop sending your sacred coffee into a spiralling mess and your nerves a puddle of despair! If you're saying to yourself, "Nope. Never been there" - you're lying! We've all been there! It's a parental rite of passage that we must embrace! Tuesday morning, lunches were packed, homework had been signed, we even got to school on time and without incident. Gracie had a terrific skating lesson, was a little fish at swimming and even entertained sitting in her stroller for a quick trip to the mall (with the bribery of a pretzel of course) to knock a few items off the old Santa list. With my mouth-watering butter pecan latte in hand and Christmas melodies playing in the background, I thought, "This is nice! Very nice indeed!" Then, "Mama! I gotta poo!" interrupts my moment of holiday bliss. We run to the restroom, where she informs me she does not have to go now. (Grrr) "Gracie, we have to get your brothers in five minutes. If you have to go, go now!" Pleading with a three-year-old is like sticking your finger in an electric socket: burning and unproductive. Then, without warning, the downward spiral begins. It's raining and instead of staying inside the boys have been waiting outside. So, now they're wet and apparently quite grumpy! Middle child is unimpressed by my tardiness and informs me it's quite difficult to eat cereal for lunch when you don't have a spoon (thought for sure I'd packed a spoon), then proceeds to dramatically emphasize the extent of his starvation! Noah had been signed up for a hot lunch (macaroni - his favourite), however, apparently they ran out, so he only had a bun for lunch! A bun, that was it! SERIOUSLY! Ugh, the chest pains were back! My nice, happy day had gone to pieces. Home base was just more crazy! "He's looking at me funny!" and "Don't touch that it's mine" or "Mom! She's got my light saber!" and "I don't like that, I'm not eating it!" Then onto "Where's my hockey stick, I've got hockey tonight!" Blah, blah, blah! Whine, whine, whine! Was there a full moon tonight? Don't worry honey, Mommy is just going to take the light saber and stick it in her eye! Addled is an understatement. With that, my hubby arrives home in the nick of time. Noah and I run to the van as I shouted, "Good Luck honey!" And I'm free! From there we putter onward. Wednesday afternoon consisted of groceries and what not, only today I had a glorified blonde moment and actually forgot where I had parked the van. Of course, now the holiday shoppers are like vultures. The moment you set foot in the parking lot, you are a marked target! Now, all eyes were on me and in what direction I was headed. Problem was, I truly had no idea! At one point I actually laughed out loud. "Nope, not my van" Then, "Ah ha! - Jingles...not that one either." For a second I contemplated going back inside. Then, I did what any self-respecting person would have done...pretended to talk on my cell phone while I haphazardly meandered through the parking lot praying I would find my car. It didn't look good! Now you may be asking yourself, "Why didn't she use the remote and honk the horn?" Well, you must own a vehicle without any quirks for that to work. My vehicle prefers that you be right in front of it before you press the "find me" button! Finally, I found my car and enjoyed a good laugh at my own expense. Should I be concerned over my incident of memory loss? Maybe. Maybe not. When it was all said and done, I had my car, my groceries and three kids accounted for. Sounds like a success to me! I have a wonderful husband, three adorable children, drive a mini-van (what else are we all fitting into), love a good chick-flick and live on an awesome street. I am not a morning person nor will I ever be. I love being a night owl, yet strongly regret it in the morning when the pitter-patter of little feet stampede through the hall. 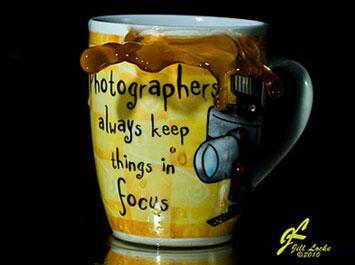 Repeatedly! The fact my kids make it to school on time still amazes me. Hence, an outlet, refuge and sanctuary had to be found...Mommy Jingles is born. Thoughts, rantings, trials and successes from a mother, wife, friend, and an occasionally "I'm gonna loose it" woman! Baked beans are a dish that holds a place close to the heart of Newfoundlander's and New Englander's alike. It's an East Coast thing I suppose. With ingredients from our isolated coastal past such as dried beans, molasses and salt pork staples in Maritime kitchens, it's no wonder this meal is so popular from from the tip of Newfoundland down to Boston, with many variations along the way. While I like salt pork or bacon as a base to my baked beans, I wanted to try something different and have a good quantity of meat in the final dish. Thinking back to canned pork and beans I ate as a kid, I thought why not make a baked bean dish with tender sirloin pork chops (also called county style ribs). With a busy work week ahead, I hauled out my slow cooker to do the job. Since beans love the low and slow cooking method, the slow cooker was the perfect choice. 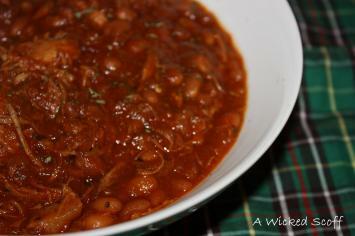 The result was a delicious, rich, hearty baked bean dish with tender morsels of pork and a tangy sweetness from the molasses, mustard and vinegar. You can also taste the beer! Slow Cooker Pork and Beans Ingredients: 1 pound dry navy beans, sorted, rinsed 2 medium yellow onions, diced 1/2 cup molasses 1/4 cup dark brown sugar 1 cup good beer (such as Sam Adams Boston Lager or Quidi Vidi 1892) 4 Tbsp deli mustard 1 Tbsp apple cider vinegar 3 Tbsp Worcestershire sauce 1 Tbsp dried summer savory 3 cups tomato puree 1 cup water 2 lbs sirloin pork chops or southern style ribs Directions: To give the beans a head start and to ensure they become tender in the slow cooker, boil them in water for 10 minutes while you prepare the remaining ingredients. Place all the ingredients in the slow cooker, including the pork ribs and drained par-cooked beans. Stir well so that everything is combined. Cover and cook on low until the beans are tender, 8-10 hours. Remove the pork chops/ribs from the pot and remove the meat from the bones. Return the pork meat to the pot. Season with salt and pepper to taste. Serve with some good bread and a nice bottle of beer. Read more here: http://awickedscoff.blogspot.com/ About Me...The Wicked Newfoundlander I'm originally from Newfoundland, Canada, and very proud of it! I moved to upstate New York in 2007, and I spend much of my time working and playing throughout New England. Besides my wife, our dog and hockey, I'm passionate about food. I love to cook and create great tasting food. I also love tasting and critiquing food, and comparing regional cuisine (notably Newfoundland and New England dishes). One of the most satisfying meals in my mind is a steaming bowl of homemade soup. It warms you up on a chilly evening and is a cure for what ails you. Good soup was part of my youth, with a mother and grandmother who made great, traditional Newfoundland soup, namely chicken and rice soup, turkey vegetable soup, pea soup, and beef and barley soup. I can't count how many times I saw Mom or Nan standing over the pot with a paring knife and an onion, slicing off small pieces and using her thumb like a cutting board. While not a technique I would use, I've seen many other Newfoundland "moms" using the same method. With results that were so good, who am I to question their technique? After a couple weeks of disregard for what I ate and drank, or how much I exercised, I really needed something nourishing and satisfying. With a lingering bout of a cold, homemade soup was the answer. Following the wisdom of James Barber (The Urban Peasant), I used what I had available in my fridge and pantry, kept it simple, and easy! 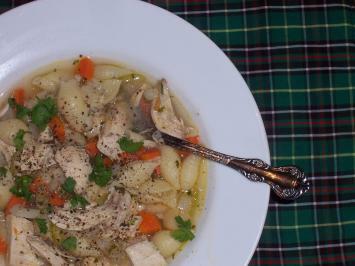 I had three bone-in chicken breasts in my freezer, staples of onion, celery and carrot in my fridge, and medium shells (pasta) in the cupboard, so with a few other ingredients, my quick chicken soup was made. Here is my recipe, but feel free to use what you have for substitutions. Chalet-Style Chicken Soup Cook in a large Dutch oven, over high heat, 3 bone-in chicken breasts with enough water to cover (water should be about 2 inches from the top). Chop and add one small onion, 3-4 leafy parts of celery ribs, one carrot, plus 1 bay leaf, 1 tsp of salt and a few grinds of black pepper, plus 1 tsp of summer savoury. Once the lot comes to a boil, reduce heat to a simmer. Cover and cook for 45 minutes. Remove chicken and allow to cool until they can be handled with bare hands. With a slotted spoon, remove vegetables from the stock. To the cleared stock, add:  1 medium onion, minced  3 ribs celery, halved lengthwise and sliced thin  3 carrots, quartered and slice thin  1 small turnip, diced fine  1 large potato, diced fine Simmer for 15 minutes. In the meantime, remove skin and bones from chicken and dice or shred with hands into large chunks/pieces. Once veggies have cooked for 15 minutes, add chicken and add 1/3 pound of medium-sized pasta shells. Cook for an additional 8-9 minutes, until pasta is al dente. Be sure not to overcook the pasta. Add a bunch of chopped flat leaf parsley for colour and to brighten up the flavour. Taste, and adjust seasoning by adding salt and pepper. For me, this soup was just what we needed. It was savoury, rich, flavourful, and extremely satisfying...everything a good bowl of soup should be. Enjoy!
" My brain had stopped all efforts to retain the words coming out of her mouth. Gibberish would have made more sense. Seven weeks passed with several failed attempts at ordering my finely tuned latté. Yet, I persevered and finally felt confident that I had not only manufactured that perfect latté order, but would make my request via drive-thru! I sat tall in my seat as I rounded the bend to the speaker, Hi! What can I get started for you today? I collected my thoughts then politely asked for a venti, non-fat, sugar free, vanilla café latté. Then came the response. Alright then, thats a venti, skinny vanilla latté? WHAT?" I blurted out, feeling defeated and slightly panicked. I babbled on, "Skinny? Didnt I ask for a sugar free, non-fat latté thingy? Where did this skinny stuff come from? I continued to mumble my confusion, loud enough for the voice in the box to hear as his entertained chuckle caught my ear. I was mortified and now extremely confused. As I approached the window to collect my latté, the barista's smirk was just enough to add severe embarrassment to the menu. Still, I had to ask, What's skinny? Today, five months later, I am as equally as muddled as ever. I have, however, mastered my request for a venti, skinny vanilla latté. Sadly though, my latté repertoire ends there. It's the only thing I order because it's the only think I can order. And the buck doesn't stop with "skinny." There's also "extra foam," or "no foam" - even "extra hot. Intimidated and bewildered, I ask you, where did the simplicity go? But I vow to broaden my horizons allowing my tastebuds to be tingled by the Caramel Macchiato, to savour the cocoa of a Mocha delicately topped with whipped cream. Now, if only I knew exactly what any of this was... So, I'm challenging you to challenge me. Share your favourite beverage of choice. Email themommyjingles@gmail.com, or simply post a comment here on my blog, then I will pick one of your suggestions to try for the week. Ive got my Starbucks card loaded and Im ready to start sampling! Thursday June 2, 2011 A Wicked Scoff just returned from a Memorial Day weekend vacation touring beautiful Cape Cod, Massachusetts. While a lot of the days were filled with activities such hiking along the sand dunes of the Cape Cod National Seashore and soaking up the sun on the beaches, there was no shortage of time spent enjoying the fresh local seafood. The first feed I had was a fried fish sandwich at Cooke's, one of the many seafood places (known as clam shacks) on the Cape. These establishments usually both eat-in sit down/take-out places and often there is the option of outdoor picnic table seating. The sandwich was served on a fresh, warm New England style hotdog roll with a long, thick piece of battered and fried white fish fillet (haddock I think, and definitely freshly caught) topped with shredded lettuce and a side of tarter sauce. The combination of taste and textures was just perfect, and paired with some thinly sliced homemade onion rings and a strawberry milkshake, I was in heaven. Unfortunately, the fried fish sandwich is not all that popular in Newfoundland, as I've rarely seen it anywhere besides McDonald's (the Filet-o-Fish) and that doesn't really count in my opinion. I encourage you to try making this sandwich at home. The recipe I have hear uses a soft hamburger roll and a wide, flat cut of cod, however you could use hot dog rolls and a thin, long cut of fish. You can also use cod, haddock or any kind or fish for that matter...just make sure it's fresh! The key to this sandwich is a good quality soft roll. As for the tarter sauce, you can use one out of a jar, but since it's so easy, just whip one up yourself and you'll be happy. Battered and Fried Fish 1 1/2 cups all-purpose flour 1 cup cold beer or water 1 egg, beaten 1 Tbsp baking powder Pinch of salt Whisk all ingredients together until smooth. I like a thin batter. To get the desired consistency I dip my fingers in the batter and let it drip off. I do a count on how long it takes to see my skin through the batter. I'm looking for a count between 1 and 2 seconds. Next, season portions of fish with a little salt and pepper, dredge in flour, dip in the wet batter and cook in 375 degree oil until the fish is golden brown and cooked through, about 4-6 minutes. Season hot fish with a little salt. Lay cooked pieces of fish on a wire rack and reserve in a warm oven until ready to serve. Best to serve them right away so they are crispy. Tarter Sauce Before preparing the fish, mix the following ingredients in a small bowl and season to taste. Place in the fridge to let the ingredients get to know one another. 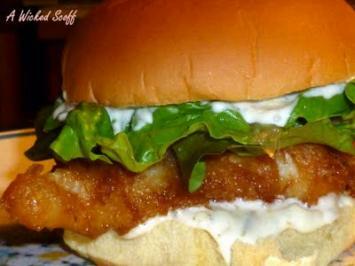 1 cup mayo 1 Tbsp lemon juice 1 heaping Tbsp sweet green relish 1 Tbsp brown malt vinegar Pinch of salt and black pepper Assemble the sandwiches by toasting the rolls a little on their cut side (place under the broiler for a minute) and then add tarter sauce, the fried fish fillet, lettuce and more tarter sauce. Bite in and enjoy. Read more here: http://awickedscoff.blogspot.com/ About Me...The Wicked Newfoundlander I'm originally from Newfoundland, Canada, and very proud of it! I moved to upstate New York in 2007, and I spend much of my time working and playing throughout New England. Besides my wife, our dog and hockey, I'm passionate about food. I love to cook and create great tasting food. I also love tasting and critiquing food, and comparing regional cuisine (notably Newfoundland and New England dishes).